I really respect Tina Fey. I think she is brilliant. She writes, she performs and she is so real. And now she is a champion for what women WANT to eat. As I sit here eating my two, small, oatmeal pancakes with molasses I feel vindicated because Liz Lemon would like these, too! She had given me the courage to speak the truth. I will admit it. I AM A LASSY GIRL! Tina Fey has made Liz Lemon is an icon for shameless indulgence. For example, the episode aired recently where Liz Lemon was so addicted to Churritos and ate so many that she ended up with symptoms of pregnancy. A whole different slant on a “food Baby”. Come on. You’ve done it. You’ve eaten the whole bag of Cheetos, or Cheezies (insert here, any bright orange cheesy snack like those plastic tubs of cheese balls you get at KMart). We know that most women focus on their weight and how they look. We are conscious of how people (men) look at us and believe we are unfeminine if we “chow down” or bear the fruits of our eaten labour. Do you remember what you ate on your first date? Water and salad? Popcorn? I bet you didn’t eat pulled pork poutine! Even at the fair (before you were in a “committed” relationship) I bet you didn’t eat: corn dog, funnel cakes, corn on a stick, candy apple or a whole bag of mini-donuts! Maybe a couple of pinches of cotton candy. Click on this and see how I feel if I don’t get my Mac and Cheese! Liz Lemon has liberated us! We can be women and eat what we want. She invented (well, probably just publicized) the “Cheesy Blaster”, a jack cheese-stuffed hotdog, wrapped in pizza! She is the heroine of 30 Rock and has become the torch-bearer for women like us. She is not portrayed as the big, ugly, sloppy guy but the attractive, successful woman doing what she wants, where she wants and wearing what she wants. Of course she doesn’t have the confidence WE see, but that’s the joy of the character. I have to keep reminding myself that she is a made-up character – or is she???? She has brought fun back to food. I love wrapping Pillsbury Crescent Rolls around wieners stuffed with cheddar cheese. Seriously, the crescent rolls are more fun that the “Wiener Wraps”. She pokes fun at “Food Culture” and she does it in the heart of New York, where food and fashion are sacred to the world. We love things fried with breading and batter. Indulgences are just that, indulgences. Moments of self-love that we are afraid to honour. I’m not talking about binges, overeating, or evereating but moments where we eat what we want. “People who believe that success with healthy living or weight management necessitates never eating junk food are more likely to fail in their long-term efforts than folks who have a small amount of what they need to be happily satisfied,” says Freedhoff, a professor of family medicine at the University of Ottawa. YES! Sometimes we have to have bit of that! No more joyless restraint. We can make focused-eating – joyful – knowing that we have foods like Carnivore Pizza at the end of the week! I will not be ruled by “fashion” and “health” magazines. I will honour my promises to myself (and Michelle Fretz). It isn’t cheating if you build it in. 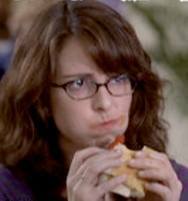 Liz Lemon isn’t self-conscious of lettuce in her hair or mustard on her shirt. She is concerned about her work and her future. She cares about those around her even more than herself. I would do well to emulate her – except, without the histrionics. I don’t have a writer as good as Tina Fey! Click on this if it isn’t shown on the page! Liz Lemon and Food! ~ by 1fatgirlshrinking - Diane Kirby on May 28, 2012.